Oh, my goodness, Oatmeal Peach Cookies are amazing cookies! 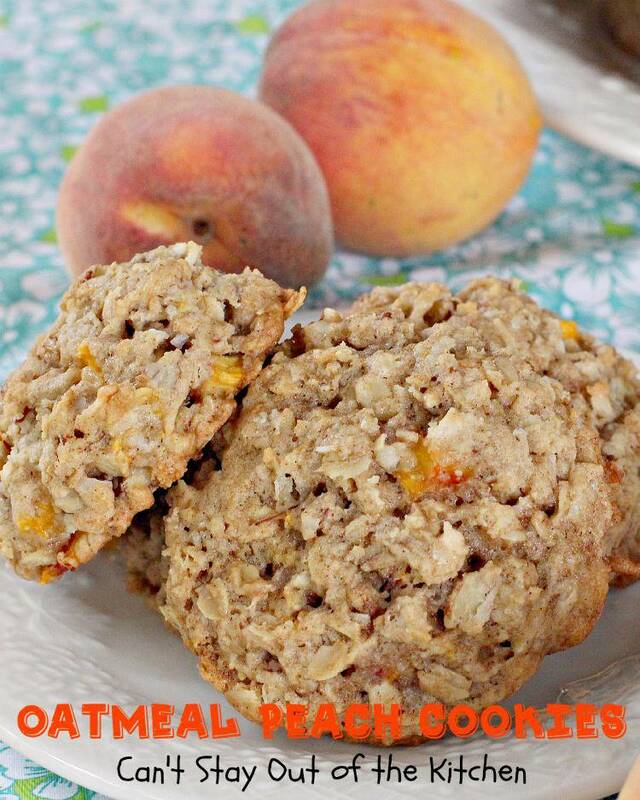 You’ve heard of Oatmeal Raisin Cookies, surely? This cookie is really a take-off on those cookies. 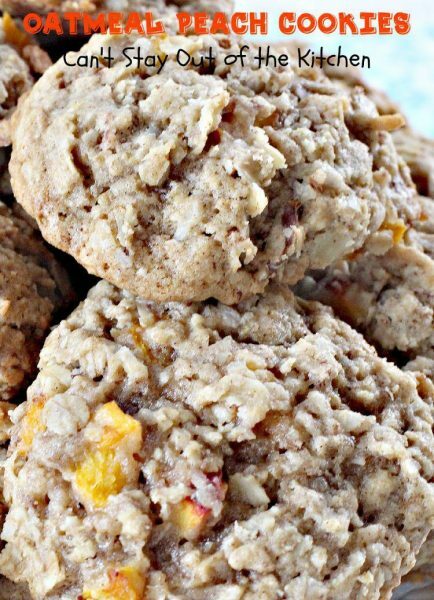 This scrumptious oatmeal cookie starts with my Laura Bush’s Cowboy Cookies recipe which is wonderful itself. 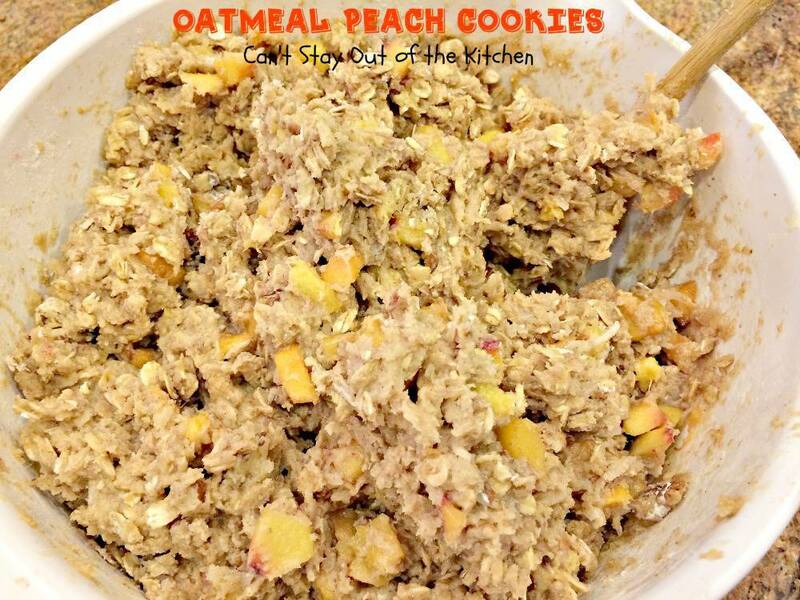 That cookie contains oatmeal (duh! ), coconut, pecans, and chocolate chips. Well instead of the chocolate chips I used diced peaches from our peach trees out back. They were awesome. I sent two batches of these cookies out to one of the departments at John’s office and they have been asking for the recipe, so finally I’m posting it! The first batch I made (the ones they got) were not the best (sorry 🙁 ). I had to go back and adjust the recipe adding additional flour the second time so the cookies wouldn’t flatten out too much. The second batch (pictured), came out a whole lot better. Both tasted great, but the second batch was a little softer and easier to handle than the first go-around. 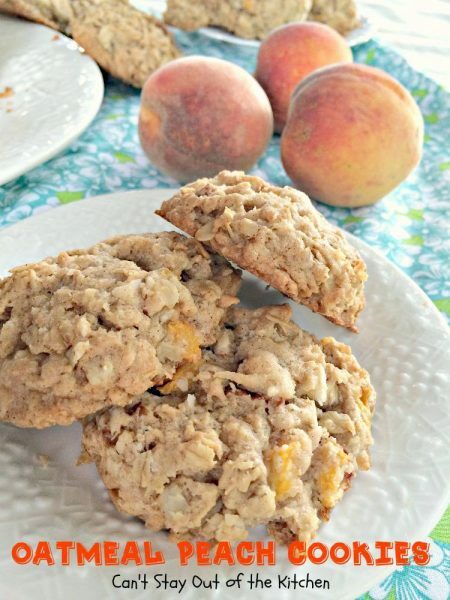 Many of you know I’ve had my hands full the past couple of weeks paring up peaches for lots of delicious dessert recipes. I did finally get all of them used up for recipes, but it took 10-12 straight days of eight-to-ten-hour shifts of baking to get it all done! I’m so glad to finally have my house clean and in order again, and yes, have a chance to relax and post about all my labors. I combed through many, many recipes in my own cookbooks and on Pinterest trying to find recipes that would be conducive to adding peaches. I used some of my Apple Cake recipes and converted them. I also used many of my favorite cookie and bar recipes. I made pies and cobblers galore! I would weigh over 200 pounds now if I’d eaten all that stuff! Thankfully, I was able to share a lot of it with friends, coworkers, and folks from church, but I can tell you, it’s been hard to stay out of it–especially the pies. Pies are really a weakness of mine. I made three different kinds and will be rolling them out tomorrow! Oh, yum. I’m salivating already. 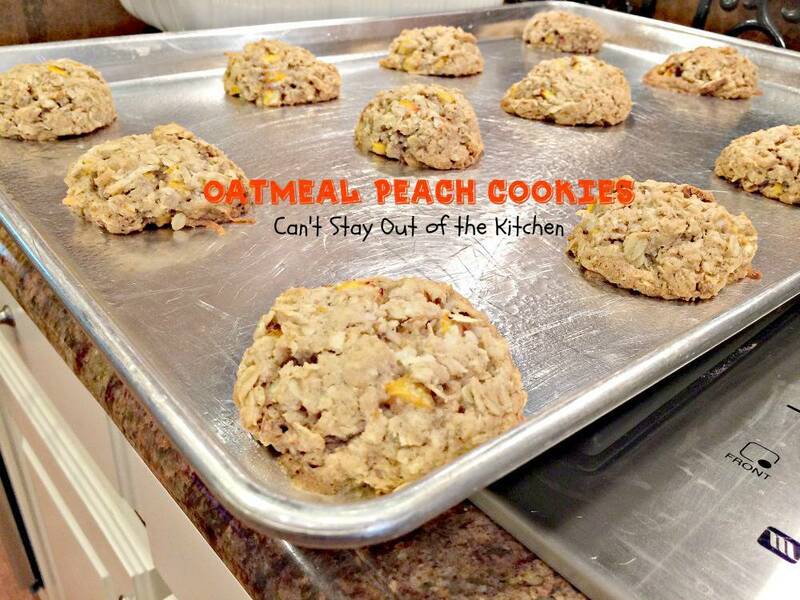 If you enjoy oatmeal cookies then you will probably love Oatmeal Peach Cookies. I really enjoyed the additions of pecans and coconut and then tossing in the peaches made them out-of-this-world good. Okay, so for those of you who have been asking for this recipe, here it is. Enjoy. 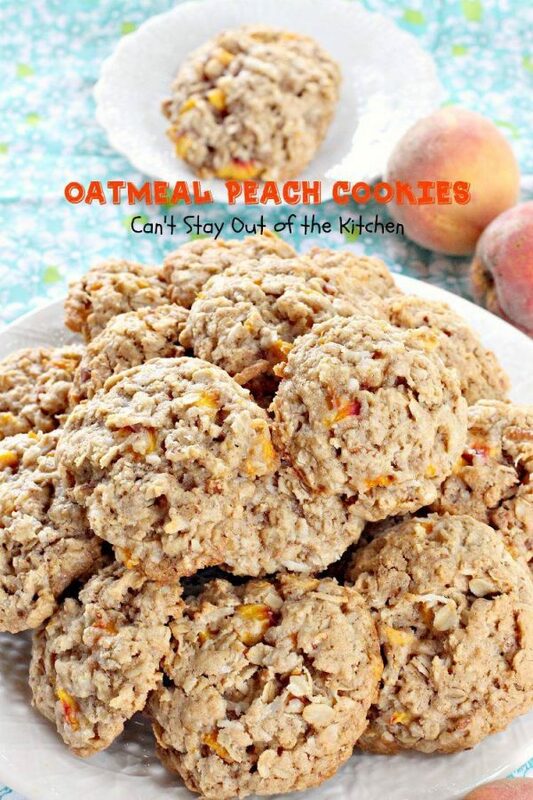 Oatmeal Peach Cookies are incredibly good. These cookies are great treats during the summer when peaches are in season. Oatmeal Peach Cookies are filled with oatmeal, diced peaches, pecans and coconut. 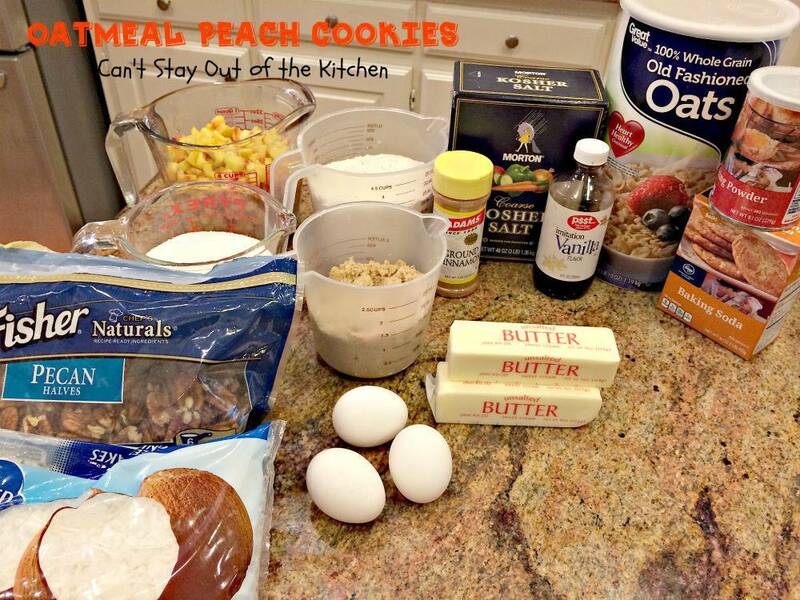 I used these ingredients to make Oatmeal Peach Cookies. Soften butter and put it in a mixing bowl. Add sugar, brown sugar, eggs, cinnamon, baking soda, baking powder, salt, and vanilla. Combine ingredients with an electric mixer until creamy. Add UNBLEACHED all-purpose flour. Bleached flour toughens baked goods. Add oatmeal. I only use the old-fashioned oatmeal, not quick oats, or the stuff out of packets. 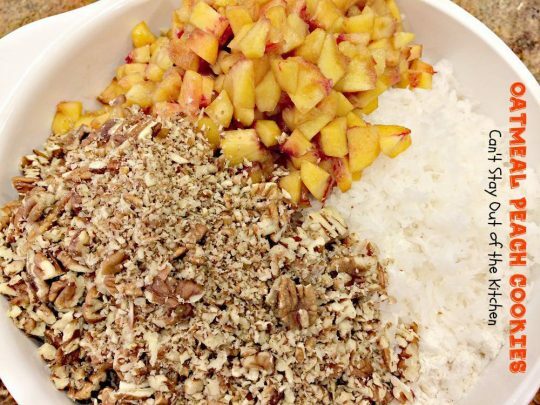 Add chopped pecans, finely diced peaches and coconut. Spray cookie sheets with cooking spray. Using a 1/4 cup ice cream scoop, scoop dough and place on cookie sheets. Bake at 350 about 17-20 minutes. Remember these are whopper sized cookies so they will take longer to bake than if you make them the normal size. 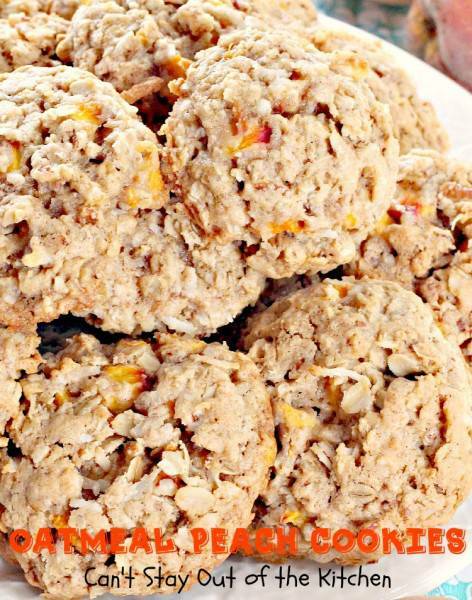 Grab a plate and some milk and have a sample of these scrumptious cookies. I guarantee that if you take these cookies and share them with friends, they will soon be gone! 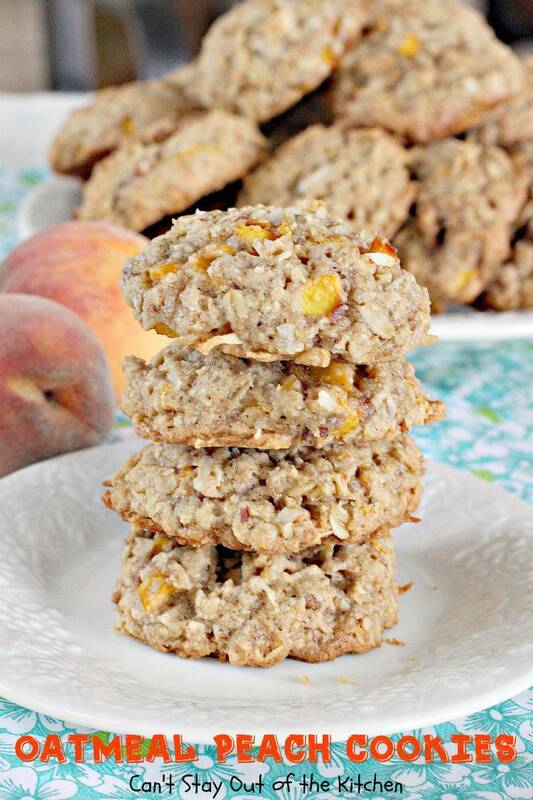 These amazing oatmeal cookies contain fresh peaches, pecans and coconut for an explosion of flavor and cookies to die for! Stir in flour, peaches, oats, coconut and pecans with a wooden spoon. For each cookie, press dough firmly into a ¼ cup ice cream scoop. 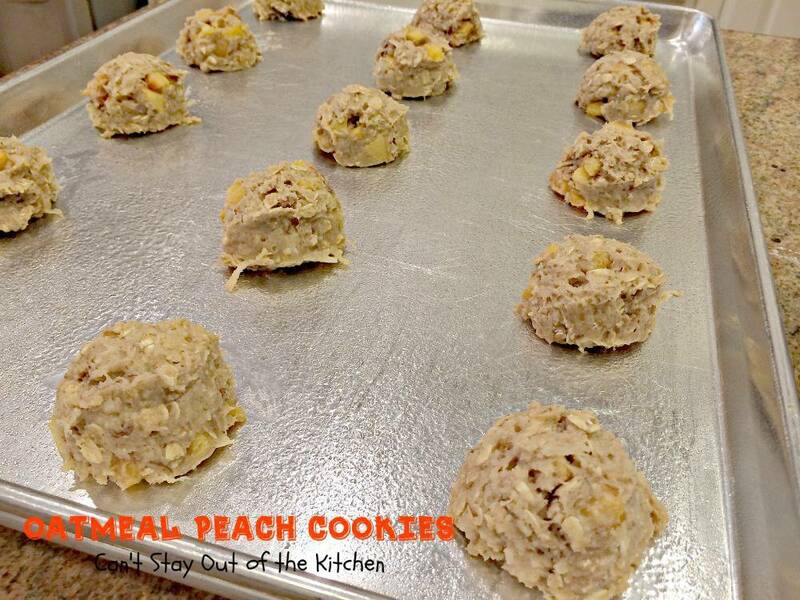 Release cookie dough onto cookie sheets sprayed with cooking spray, spacing 3 inches apart. Cool in pan 10-15 minutes. Remove to rack to cool. NOTE: I measure out 2 cups of pecan halves and chop them. 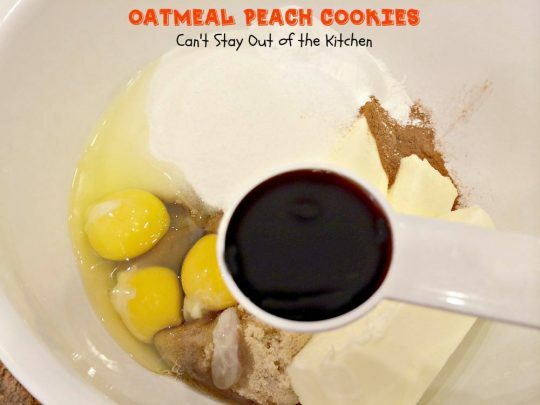 NOTE: This mixture has to be on the dry side because the peaches ooze during baking. NOTE: Remember these are whopper sized cookies so they will take longer to bake than if you make them the normal size. I measure out 2 cups of pecan halves and chop them. 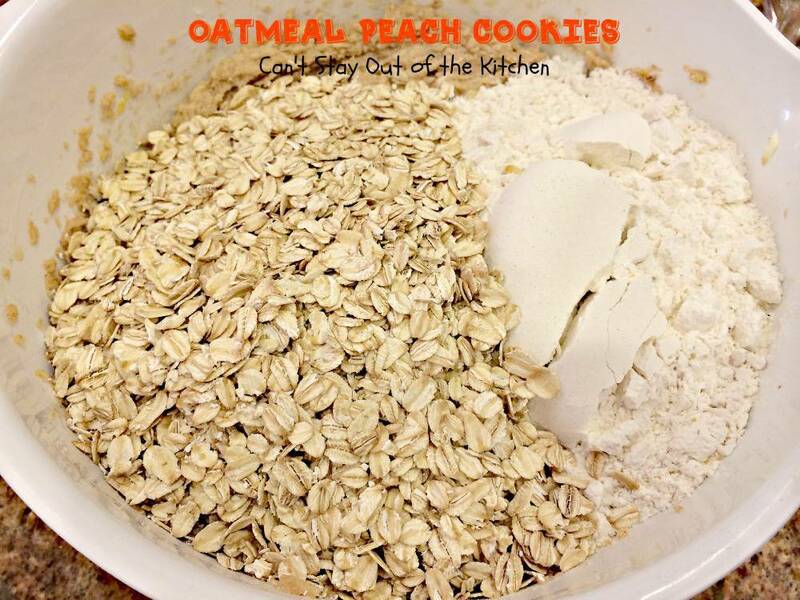 [br][br]This mixture has to be on the dry side because the peaches ooze during baking. [br][br]Remember these are whopper sized cookies so they will take longer to bake than if you make them the normal size. 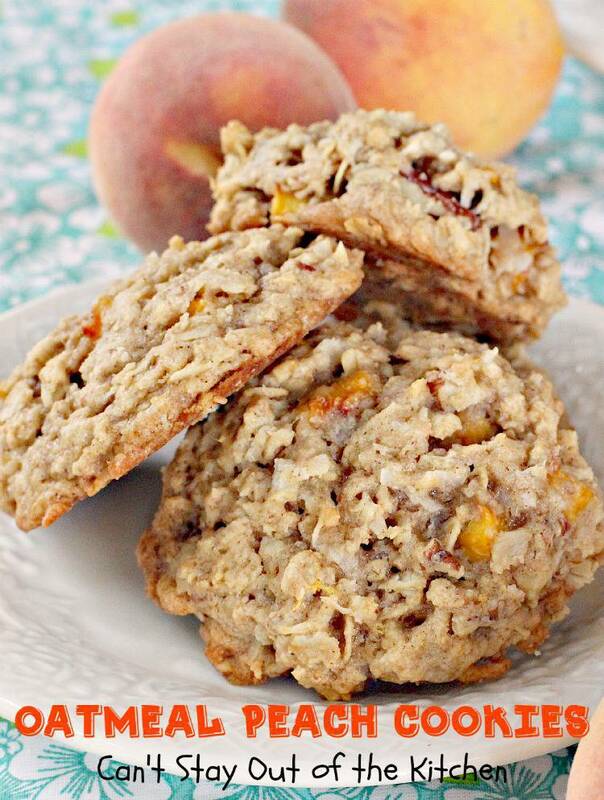 Oatmeal Peach Cookies will satisfy every sweet tooth craving! 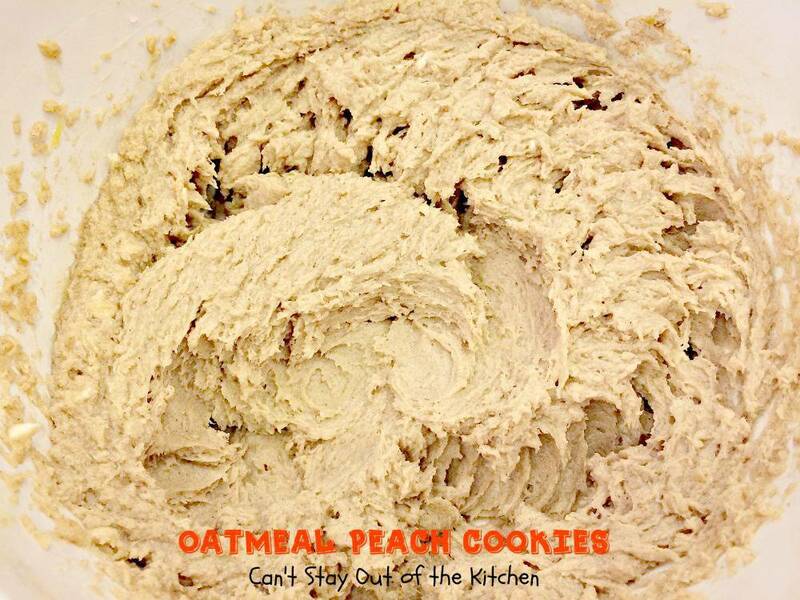 If you love Oatmeal Raisin Cookies, you’ll love Oatmeal Peach Cookies! Time to digest a few! 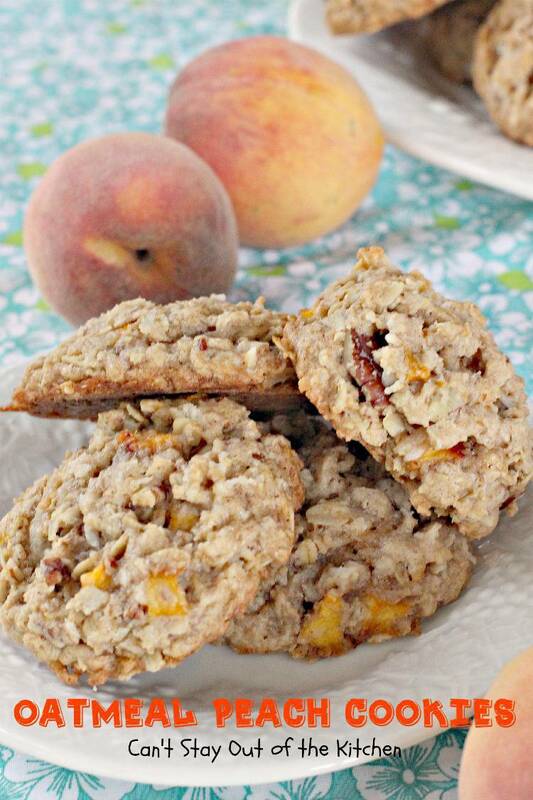 Can you use frozen peaches if fresh are not available? I really want to try this recipe. I’ve never tried it with frozen peaches, Sue. I would probably thaw them and then make sure the peaches are dried very well before adding to the cookie dough batter or you may end up with runny cookies. Thank you for responding so quickly!! I think I’ve had two more since I sent that last message, so there will be less to freeze at this rate! 🙂 What is the best way to defrost frozen cookies? On the counter or in the fridge? Thanks! I just made these and they are AMAZING! I was wondering what the best way is to store the extras? Should I refrigerate them? Would it be ok to freeze some as well? Thanks! Nicole, I am so glad you enjoyed them. Yes, you can absolutely freeze them. That’s what I did. Then you can divvy them out as you need to. They will be okay on your counter in an air-tight container for a few days, then you should probably freeze them after that. Love oatmeal cookies! These sound amazing with all the coconut, pecans, and of course, the peaches. Peaches are my favorite. Peaches are my favorite, too, Laura. They really were amazing. I hope you give them a try while you can still get fresh peaches at the store!